Do I have to pay Power2Switch for helping me switch electric suppliers? I'm not sure how to read my utility bill - how can I tell if I will save? How do I switch electricity providers? That is, will I have to do anything to make the switch? Do I have to get my landlord's permission? Will my power go out when the switch occurs? Does someone come to my house? What is the length of time to switch from ComEd or Ameren? Same week? Two weeks? During a power outage (weather-related, or otherwise), who should I call? Will ComEd or Ameren make me less of a priority because I don't use their service? That is, will I be the last one to get my power restored? How much money will I save using Power2Switch and by changing my electricity supplier? What if I don't like my new supplier? Will Power2Switch allow me to change again? Will it cost me anything to switch back? What is deregulation? Is that why I'm able to switch now? What does my current utility company (that is, ComEd or Ameren) think of electricity deregulation? Who are the new electricity suppliers? Why am I not familiar with the alternative electricity suppliers? If the rates change and ComEd becomes less expensive than my supplier, would I still have to pay the fee for early termination? So my bill still comes from ComEd? Or from my new supplier? Both? Do I have to sign a contract with my new electricity supplier? I'm on budget billing with ComEd? Do the new suppliers offer this? Why does the rate on my bill look different than the one on your site? Will I have to pay an Early Termination Fee when I move? Why should I trust Power2Switch? Aren't you just like all the other suppliers who go door-to-door? How does Power2Switch make money? What's in it for you? I am still unsure. Can I e-mail or call Power2Switch with any questions? I've heard about reports (complaints) of alternative energy providers offering low initial rates, but then raising their rates after 3-6 months or at the end of the contract. People say that by the end of the year they end up paying hundreds more than before. Is this true? I should switch through Power2Switch.com instead of going directly to the supplier, because...? I'm part of a cooperative or a municipal aggregation. Can I still switch? My municipality recently aggregated our electricity. Can I switch suppliers? NO, there are absolutely no fees (hidden or otherwise) to use Power2Switch. We do not even ask for your credit card information. If you add those numbers together, you will have the total supply rate. Then, you have to multiple that total supply rate by 100, to equal 7.73¢ per kWh. This rate of 7.73¢, called the Price to Compare , is the number you would put side by side with the other suppliers' rates. How do I switch electricity providers? That is, will I have to do anything to make the switch? For example, will a technician need to set anything up (like when I swap cable companies)? Switching suppliers is done entirely through our site, and Power2Switch makes the process extremely easy; you can sign up in just a few minutes (unless you never learned to type--in which case, give us a call!). Simply have your most recent electricity bill available, visit power2switch.com, plug in your zip code, and review the suppliers' rates and plans for your area. After you choose the supplier that best suits your needs, you will be prompted to enter your personal data (name, address, etc., but not your credit card or social security number) and e-sign the contract. The Power2Switch team will do the rest! No one will come to your home and you will not experience an interruption in service during the change. If you currently pay your electricity bill yourself, you will not need to obtain permission from your landlord. If your electricity expense is included as part of your monthly payment, then ask your landlord to sign up here! Your power will remain on during the switch to a new supplier. Remember, the supplier is the company that purchases electricity on your behalf, but your local utility will not change if you make the switch. As a result, no one will visit your home to make the switch. The switching process takes anywhere between 30-45 days. It ultimately depends on when your meter is scheduled to be read by the utility company. Once that occurs, you will receive a notification in the mail from the utility with information about your final utility bill and switch date to the new supplier. When the lights go out, call the utility company - ComEd or Ameren -- for your area. Even if you switch to another electricity supplier, you still pay your utility for delivery/distribution and maintenance. For ComEd customers, call the ComEd customer service team at 800.334.7661 (press 0# at each prompt and bypass the messages until you can speak to a representative). Ameren customers should call 800.755.5000 for service interruptions. No, you will be treated just like everyone else. The utility companies own and maintain all of the power lines in your area and they are paid a transmission fee by your supplier; this guarantees you receive the same service as everyone else in your neighborhood. The utility companies also do not profit off of the sale of electricity, so they are indifferent as to whether you purchase your electricity supply from them or an alternative supplier. How much money will I save using Power2Switch to change my electricity supplier? Most of our customers save 21% on their electricity, depending on which supplier they choose and if they select a green plan. This number is calculated by comparing the current seasonal base rate, or the Price to Compare , for a popular utility (ComEd or Ameren) against our lowest priced rate plan from one of our suppliers. That difference is currently 21%. To find out how much you can save go here and enter your zip code. What if I don't like my new electricity supplier? Will Power2Switch allow me to change again? Will it cost me anything to switch back? Most suppliers have a brief window of 3-5 days in which you can rescind your switch and cancel at no cost to you. Beyond that, you have the option to cancel your plan at any time in the future, however, you may be required to pay an early termination fee like you do with most other agreements (insurance, phone, cable, etc.). Otherwise, there is no charge to switch back to ComEd, though you may be required to stay with ComEd for 12 months before you are eligible to switch again. You are of course able to switch to a new supplier once your contract is up. Your electricity service includes two parts: supply and delivery (distribution). Supply involves the purchase of electricity and transmitting it across the power grid; delivery takes place on a local level through your utility company. In a regulated market, the utility company (e.g., ComEd or Ameren) handles both the supply and delivery of electricity to your home or business. In a deregulated electricity market, the utility continues to manage the delivery, but is no longer the sole supplier of electricity; the market is opened up to alternative suppliers to promote competition and ideally result in lower rates for consumers. Regardless of who supplies the electricity, the utility is still responsible for maintaining the wires, poles, and meters, along with restoring service should a power outage occur. What does my current electricity distributor (that is, utility) think of electricity deregulation? Your electricity distributor is mandated, by deregulation, to facilitate the entry of other retail electricity suppliers into the market. The deregulation laws are available online. On top of that, distributors actually make the most money from the distribution and maintenance of the grid-those lines and infrastructure that carry the electricity to your home-and we still pay them for that. In fact, they are prohibited from profiting on the supply of electricity entirely. So the new market structure suits distributors just fine. All Power2Switch electricity suppliers are certified and regulated by the Illinois Commerce Commission and have been vetted to ensure that you are protected from any wrongdoing. They have also completed a registration process with ComEd to service customers in ComEd's territory. You can review the list of approved suppliers at the Illinois Commerce Commission. Deregulation has been in effect for over a decade, but only recently have new suppliers been able to service customers as a result of recent changes to billing practices. The Chicago Tribune reported on the Illlinois Commerce Commission's decision to enable alternative electricity suppliers to enter the market in January 2011. For more media coverage of the deregulated electric industry and Power2Switch, please see our press page. To do business in Illinois, an electric supplier must be certified by the ICC and complete the utility's registration process. Yes, just as you would for a cell phone plan, you likely have to pay a fee to cancel your plan before the end of the contract. ComEd's rates are set for a year in advance each May, however, so they will not just decrease - or increase - out of the blue. Their rates are fixed as well. Once your contract expires, you will be able to evaluate all of the rates and plans again and switch to the most appropriate for your situation. So my bill still comes from ComEd or Ameren? It all depends on which supplier you choose. 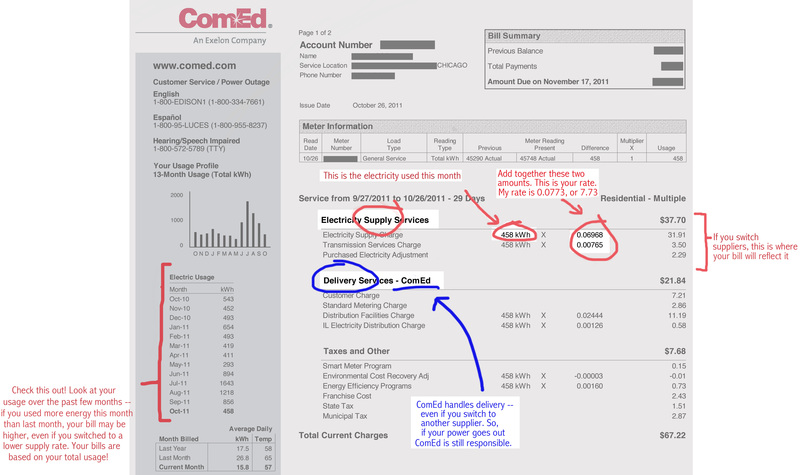 Some suppliers use ComEd's or Ameren's billing systems, while others bill you directly. The supplier profiles are in the process of being updated to indicate who is responsible for billing. In the interim, please e-mail Power2Switch or call 847.868.0247 call us if you would like more information about this. Yes, you will have to e-sign a contract to confirm that you accept the terms of the agreement. Some contracts have minimum requirements and early termination fees, while others do not. A contract exists to protect the consumer as well, ensuring that your rates are locked in for the length of the contract. Yes. You may need to re-establish the budget billing plan once you switch, however, depending on the supplier. Why does the rate on my bill look different than the rate on your site? Your bill likely has rates that are represented as fractions, such as 0.0773. The industry uses rates that are converted to cents (7.73¢) because it's easier for people to think in terms of pennies, as opposed to fractions of a penny. And it's much easier to say "seven point seven three cents" than "seven hundred seventy-three ten-thousandths of a dollar," right?? So, just take your fractional rate and multiply it by 100 to convert it to cents. It also depends. If you relocate to an area that is still within your current supplier's service area (such as moving cross-town), your supplier will expect to transfer your service to the new location. If you are moving outside of the current service area, you may be able to avoid paying an early termination fee. Check with your supplier for details. We are a knowledgeable, congenial (we like us! ), and green-minded team of professionals dedicated to providing all the information you need to make expert decisions on who supplies your energy and how much you pay for electricity. Power2Switch is an Illinois Commerce Commission (ICC) licensed broker agent consultant. Power2Switch is certified by the Better Business Bureau. We are members of 1% for the Planet, giving 1% of our revenue to sustainability services. And yes, we use our own service! Go ahead, read our bios -- see who we are. And give us a call, anytime! Why should I trust with Power2Switch? Aren't you just like all the other suppliers who go door-to-door? First off, Power2Switch is NOT a supplier of electricity. We do not buy and sell electricity, which is what suppliers do. We provide an online platform that helps you quickly compare rates and plans for the suppliers in your area and then easily make the switch to the plan that is best for you. Since our moms taught us never to open the door to strangers, we do not market our company by going door-to-door. You also won't receive a bunch of flyers from us in the mail. We rely heavily on referrals and word of mouth, so please tell your family and friends and spread the news about Power2Switch! We are given a small commission from the electricity suppliers for each new customer who switches to their service through our website. All of our suppliers offer the same commission so that we don't favor one over the others (not that we would!). Our commission also does not affect the rates you pay to suppliers; the rates on our site will be the same (or lower) as what you would find if you went directly to the suppliers' websites. We just make it easier for you by having all of the suppliers in one place -- so you can compare them and then easily switch to your preferred plan. Absolutely! We at Power2Switch are happy to answer any and all of your questions. You can e-mail Power2Switch here or call 847.868.0247, and we will get back to you as soon as possible. We love to receive feedback from potential and existing customers so we can continue to improve our service and meet your electricity needs. Once your contract ends, you have the option to sign on for another fixed contract term, or switch to another supplier. If you do not select another plan term, the supplier may default you to month-to-month plan since they cannot sign you up for another contract term without your permission. At Power2Switch, we will communicate with you prior to the end of your contract to help you evaluate all of the suppliers and their rates and select a plan that best meets your needs. While suppliers do have the option to raise rates at the end of your contract term, it is not in their best interest to increase rates significantly at that stage, as they may lose substantial numbers of customers (which they certainly wouldn't want). We cannot find any documented cases of suppliers doing this, either. Like any other business, suppliers must stand by their rates and adhere to their contract terms. All of the suppliers on our site have been certified by the Illinois Commerce Commission and have completed the registration process with ComEd. If an electric supplier or your electric utility fails to provide promised service, the law permits customers to file a complaint online with the ICC or by phone at (800)-524-0795 and / or with the Illinois Attorney General's Office (800) 386-5438 (Northern Illinois), (800) 243-0618 (Central Illinois), and (800) 243-0607 (Southern Illinois). 1. The rates on Power2Switch are guaranteed to be the exact same as the rates on the supplier's websites. Power2Switch.com receives updates electronically from suppliers every day with the most recent information on rates, plan options, and promotions. There is no need to double check the prices on suppliers' website, though if the temptation to do so is too overwhelming to resist, go right ahead - just be sure to return to Power2Switch when you're ready to make the switch! 2. Power2Switch offers rates and plans for the the largest variety of suppliers on one quick and easy-to-use webpage. The site not only ensures savings, but it's super convenient and prevents a lot of confusion! 3. Each month Power2Switch sends an email with information on the electricity used that month, the savings incurred, and relevant industry information and tips that could help save money and conserve energy. 4. Another email will arrive from Power2Switch as the plan term nears an end to indicate that it's time to reevaluate the suppliers' rates and find the best value, yet again. 5. While it's free to compare rates and switch through the site, it's not free for Power2Switch to operate it. There is a lot of time and energy -- and a ton of heart! -- involved with providing this extremely helpful service, and Power2Switch is only paid by the suppliers if customers switch to them through power2switch.com. As much as we'd like to work for free, we have kids -- and dogs -- who eat a lot! So, if you would like to compare rates and suppliers in the future and continue to receive great savings, please support Power2Switch and switch through our site. We sincerely appreciate your business and you can be assured that we will continue to provide you with excellent service as long as you're our customer! I'm part of an electricity co-operative. Can I still switch? Unfortunately, we most likely cannot service consumers who belong to co-operatives at this time. It is up to your co-operative whether to engage in the deregulated market, but most have chosen not to do so. We advise you to speak to your board members and see how they feel about switching suppliers. Unfortunately, we cannot service consumers who have opted-in to a municipal aggregation. Since you are under contract with your supplier, we can only assist you once your contract expires, or if you should move out of your municipality.